Here is the most comfortable way to carry your binoculars for hours. This elasticated binocular harness spreads the weight of your binoculars across the whole area of your shoulders for more relaxed viewing. This high comfort harness keeps your binoculars and even lightweight digital cameras close to your body, meaning you are hands free with your binoculars ready for use in an instant. The durable high comfort elastic means that there is no adjustment of the harness needed when changing from Summer to Winter clothes and visa versa. Nylon/Lycra straps are durable and allow for easy sliding of binoculars into viewing position. 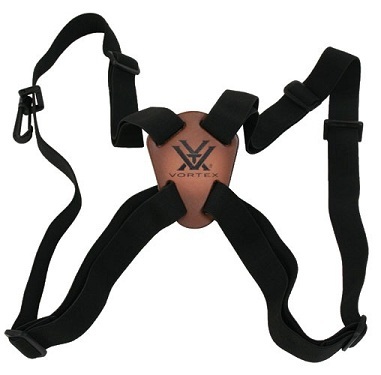 One-size-fits-all harness is easy to attach and completely adjustable.